You can't teach an old dog new tricks, or can you? 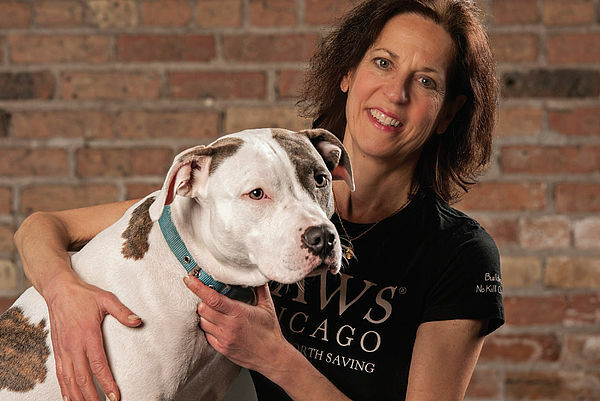 For this edition, Joan Harris, PAWS Chicago’s Director of Training and Canine Behavior, and Erin Mayes, Feline Behavior Coordinator, answered our most pressing questions about senior pets. Can old pets learn new tricks? JH A dog can learn at any age. They can learn new tricks, they can learn new behaviors, but it’s very similar to how people are. If you’ve been practicing the same habit, the harder it is to change that habit so I think that’s where that phrase came from. It really has nothing to do with the learning aspect. EM Up until the age of 16, cats generally are as mentally flexible as younger animals, according to The Behavior of Domestic Cats. For example, they are as quick in learning a new location for their food. At around 16, declines in the central nervous system are usually reflected in a cat’s behavior. These cognitive changes mean adopters may need to make environmental changes to accommodate their aging cats, such as adding extra litter boxes. How does training a puppy or kitten differ from training a senior pet? JH When you’re training a puppy, you have a blank slate so everything is new information. They are like a sponge. You can mold the puppy however you want because it has no pre-established habits. When you’re training a senior dog sometimes you have to deal with existing behaviors.If you want to modify or change, that can be more time consuming. New behaviors can be reinforced, but it’s important to keep in mind that if you’re trying to change habits, the old habits served a purpose. And you have to figure out what they are and show they no longer serve a purpose. EM Find something the cat absolutely loves. For example, every time that cat uses the scratching post, give the cat a treat. You have to give them something that is higher value than what you don’t want them doing. With senior cats it’s a matter of knowing what their limitations are. For example, they may need a litter box with lower sides so it’s easier to enter and exit the box. These are little things you can tweak in your home that can make a big difference. When you’re creating an environment for a cat, you want to make sure it’s age appropriate. So, for example, if you want to teach jumping down, you don’t want an older cat to jump down from the top of a refrigerator. How do outside factors or personal histories impact how a senior pet learns? JH If a dog was not socialized properly as a puppy, he may have fear issues toward certain things because he hasn’t been exposed to them or had bad experiences. There are various windows of time in a puppy’s development where the most rapid learning occurs–he’s curious and open to new people and experiences. There are also times, called the fear imprint periods, during which anything that frightens him could be much more lasting or even permanent. EM Cats are a product of their environment. It’s more a matter of shaping behaviors that you want with cats. It’s a long process. You’ll see that in a two-year-old cat, and you’ll see it in a 14-year-old cat. With cats you do need to take your time if you’re trying to shape a certain behavior. You just have to be patient. That’s the biggest thing cat owners need to know. What are the impacts of training and adapting to a new home for senior pets? JH Training is essential because you are opening up your lines of communication so your dog is able to understand the directions you’re giving. Training is also bonding because it sets up guidelines for the dog’s behavior so the dog feels more secure and can trust you more. Through expanding your bond and communication, your dog can be more integrated into your life because you can take them more places. EM We emphasize having a special room for your cat, which is good for all cats of any age, but for senior cats, we especially don’t want them rushed into a new environment too quickly. Start off small, by keeping the cat in a safe room where there’s nothing they can chew on or break, and be sure to block off any dangerous hiding spots.It is important the senior cat be given adequate time in its special room before being introduced into the larger home. For a prospective adopter, what is the most important thing to know about choosing a senior pet? JH Seniors can still learn and they make great pets. And I think in some ways it’s easier because you can already see their fully developed personality. If they are compatible with you, then you know what you’re getting, and many times, that’s a comfort in itself. EM They’re just as loving as any other cat. A six-year-old mature adult is just as playful, affectionate, and healthy as a two-year-old cat. And when you adopt an older cat, you are able to base your decision on the fully formed personalities, making it easier to choose a cat that fits your family.